A story has a beginning, middle and an end, but it's not necessary that they be in that order. Girish Kasarvalli's award-winning Kanasemba Kudureyaneri (based on Amaresh Nugadoni's Savaari) is a classic example of this. 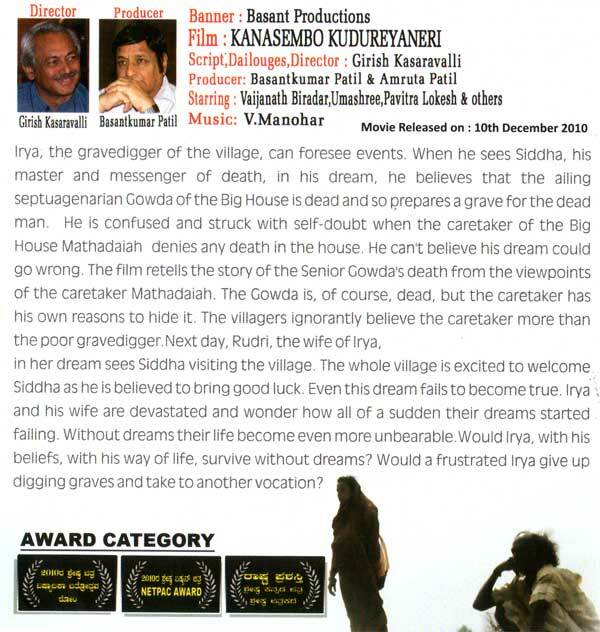 The film applies a back and forth narrative to tell the story of gravedigger Irya and his belief in Siddhas, nomads whose arrival is considered auspicious. It is believed that if the death of a person coincides with the arrival of a Siddha, the soul is sure to go to heaven. Irya and his wife are made known of their arrival through dreams. In fact for Irya, if a Siddha appears in his dream, it denotes a death in the village. However, once despite dreaming of a Siddha, Irya is told that there is no death in the village. He goes to the house of an ailing village elder, anticipating his death but is sent back by the caretaker saying all is well. As if this is not enough, a Siddha not arriving in the village despite his wife having dreamt of his arrival, crushes Irya's faith in Siddhas, whom he believes are his protectors. Is Irya an easy prey to superstitions or are scheming villagers exploiting his dreams for their own good? The film beautifully exposes the materialistic attitude of people. It leaves you wondering whether destroying one's beliefs is the only way to progress; whether there are chances of beliefs being mistaken for superstitions just because the ones who hold these beliefs are not part of the mainstream. While the first half of the film may have you raise your brows at Irya's and Rudri's dreams and faith, the second half sets out to suggest that what may look superstitious to one may be a way of life to the other. It also shows how sometimes what looks real may be unreal and vice versa, and that with faith in our beliefs, we can achieve anything.